President Nicolas Piccato of Italian Chamber of Commerce in Korea (ITCCK) poses for The Seoul Times on the campus of Sungkyunkwan University (SKKU) on March 28, 2014. Mr. Nicolas Piccato is unique in many ways. The Italian businessman, who is also president of Italian Chamber of Commerce in Korea (ITCCK), promotes Korean culture to the world though his own “Panda Media,” a company producing and distributing movies and documentaries. A perfect speaker of Korean language, President Piccato fully commands English, Spanish, and French as well as his native tongue. The mild-mannered Italian executive usually speaks French with his local Korean employees in his office located near Seoul’s Sungkyunkwan University (SKKU). 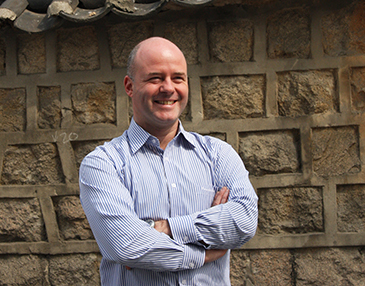 A devout fan of Korea and its culture the Italian executive loves to explore every nook and cranny of Korea’s countryside. On the weekend he rides on his motor bike to travel all the way down to Jeonju to mingle with locals and to sample the authentic Korean cuisines. 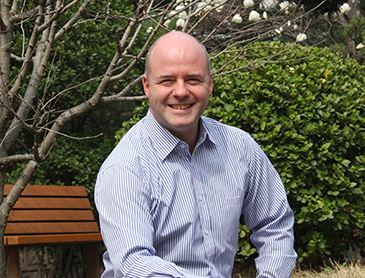 President Nicolas Piccato of Italian Chamber of Commerce in Korea (ITCCK) poses for camera during his interview at his "Panda Media" office in Seoul on March 28, 2014. Mr. Andrei Sokolov of The Seoul Times visited his office in Daehakno in Seoul and interviewed him. The following is the full text of the questions and answers of his interview. Q1: When were you inaugurated as ITCCK president? Could you tell us about your organization? How many member companies do you have? A1: Hello! I was elected president in April 2013, so exactly one year ago, after two years as a vice-president. Previously I was a member of the board of this vibrant young organization. While there have been business associations for Italy-related companies for many years and our secretary general Roberto Martorana was an acting figure of most of them, our chamber started only six years ago. It was officially only recognized last year by the Italian government, and is now one of the fastest-growing chambers in Asia. We are reaching the 100 members mark, and have many significant industrial players. As for activities and communication, we are particularly focusing on the visible food and wine industry, strong existing committee, and the luxury and fashion one, soon-to-open committee. Our members are both from Italy and from Korea, but also from third countries, and I guess what attracts them is the way we try to help them personally, on a case-by-case basis. Q2: What is your role and duty as ITCCK president? What would you like to do for ITCCK during remainder of your presidency? A2: I am supporting and helping develop the business ties between Italy and South Korea. This means some lobbying relations, but also means discussions and advice to companies and persons. I think I was elected for helping the ITCCK to gain exposure, and expand our network. Professionally we have an excellent team, able to answer any request on the local markets, and to connect with the right persons in our own market, so my objective is to get more Korean companies to work with Italian partners and Italian products. President Nicolas Piccato of Italian Chamber of Commerce in Korea (ITCCK) poses for The Seoul Times in front of the campus of Sungkyunkwan University (SKKU) on March 28, 2014. Q3: Your chamber seems to be quite busy, hosting a number of promotional events. Please tell us what are the ITCCK activities? How different is ITCCK from other chambers of commerce of foreign countries? 	...and we're working on some new other gatherings, but always based on smaller, slow gatherings, hidden in our past-faced Seoul to many galas around, and not enough time for sharing moments together. After all, it is part of our culture, la Dolce Vita! Q4: Italian restaurants are, as elsewhere in the world, very popular in South Korea as well. What is your plan to introduce more of Italian gastronomical culture to the local Koreans? A4: The main generic plan is through the Italian Food Festival that should promote the diversity of Italian cuisines to consumers in general. But the fuel of this and other plans are the restaurant owners and chef, as well as the importers of Italian products, who are member of the chamber and therefore, businessmen, willing to share their passion for food and to make their business successful by doing this. We try to help these persons as much as possible, because they help Italy, and by going all together in the same direction, it will offer choice and quality of Italian gastronomy to Koreans. Q5: You are also president of your own company, I guess media one. Could you tell us about your company? How do you do business here in Korea? A5: My company is mainly handling foreign contents in Korea: we actually are the biggest foreign content agency in Korea! Our business model suffers a bit from the conservative attitude of the big operators in Korea, who are not interested in foreign content for the viewers... Korean viewers are curious and open, but live in one of the countries with fewest foreign channels! Luckily, we enjoy working on other fields, such as cinema: we produced two international movies, “Approved for Adoption,” scheduled to be released in Korea in May this year, and “Koan of Spring” later. We also distributed a Korean movie, and are now bringing to Korea a romantic comedy shot in New York, “나의첫번째 장례식 (My First Funeral),” “Vijay and I” in English. We are also involved in the music business thanks to a partner of ours. Q6: How many Italian people live or do business here in South Korea? How would you evaluate the current bilateral relations between Italy and South Korea? What needs to be done to better promote the mutual ties? A6: A little over 1,000 Italians are around, but it is a growing community, filled with young talents and good energy. Everybody arrived with great ambition in Korea, but somehow gets deterred by the technical difficulties to do business in Korea. With its incredible growth, the easiness to do business in Korea, which was growing to, is now decreasing. I think that if Korean authorities would look more towards Europe as a partner than to the United States, it would ease very much the bilateral relations between Korea and several countries. After all, Korea, like most of European countries, has a millenarian culture, and therefore is much more similar to Europe! Q7: Could you introduce to our readers your academic and professional career? What did you do before you came to Seoul? A7: I first came in Seoul in 1996, to work for L'Oreal. I left in 1998, lived in Paris and Mexico, abandoned L'Oreal and the cosmetic world to throw myself in another kind of dream-selling industry: cinema. I first worked in a local company, and then opened the first Arthouse movie theater in Mexico City. After some years I sold it and came back to Korea as a diplomat for the French government, working as an audiovisual attache for four years in Seoul, particularly on the bilateral film co-production agreement between France and Korea. When my contract was over, I decided to stay and invested in some more Korean language classes at Ehwa Woman’s University, then worked in a local movie company, on distribution and co-production, where I had the pleasure to work on the preparation of the remake of Housemaid. I then was lucky enough to be part of the executive training program Korea, an education program about Korean society, history, economy, culture and language that took me to Paris, Milan, London, and to Yonsei University in Seoul. Q8: What do you think about Korean culture, Korean people? What are the strengths or weaknesses of them? A8: Korean people and culture are the reason for me wanting to come back and doing it in 2003. I think I was extremely lucky to witness a big part of Korean culture that completely disappeared now. I am happy that we can still listen to the great Korean rock and singers today in various LP bars, such as Sanullim, Songolmae, Kim Juja or Shim Soo-Bong among others, but some areas of Seoul have been definitely destroyed, including their old shops and restaurants, and the cold reproductions you can see in folk museum cannot render the vibrant life of the Seoul I first knew. Today, funnily enough, even if I am 12 years old (the length of my life in Korea), I feel like an old grandpa sometimes telling stories to Koreans about what Seoul was like just some years ago. Especially when talking about Gangbuk to Gangnam friends. I think the strength and witness is only one. They are fast, everything is about doing things fast. I admire that, but as an Italian I would like to teach the beauty of “slow” sometimes. Q9: How do you spend your leisure time? What kind of hobbies do you enjoy in Korea? Do you do any exercises? I love traveling in Korea. It is still a foreign place to me, and I enjoy discovering food from remote areas, or beautiful views, houses, temples... After all it is part of my job. When documentary filmmakers or journalists contact me, they expect me to direct them to the most beautiful, unique, and specific places in Korea. I am actually working on the production of the biggest documentary ever about Korea! It will be five episodes of one hour documentary, covering culture, music, literature, islands and temples. I mean the kind of Korea that is not talked about these days and everything that is behind K-pop and dramas, the real cultural Korea. It will start shooting end of May, and I'm looking forward to that month, because at the beginning of May I will travel to Jeonju that I really like, a beautiful town with great food and a spectacular film-festival! Q10: Last but not least, could you reveal your family? Are you married? What do your family members do for a living? A10: I'm not married yet, so nothing to reveal on that side, but on my family I can reveal one thing. My younger sister is expecting twins for the month of June!